We are now accepting membership dues for 2009. Please download the NMTESOL Membership application nmtesol_membership_application-12-08. We would like to thank the founding members who were able to attend the party at Bill’s house on December 7! We’d like to thank everyone who participated in Error Correction: Breaking Bad Habits without Breaking Spirits on Friday, October 3rd! We’d also like to send out a special thanks to Ann Savino, Cambridge University Press representative, who provided the professional books for our raffle. Please check back with news of our next event! Click here for some pictures! 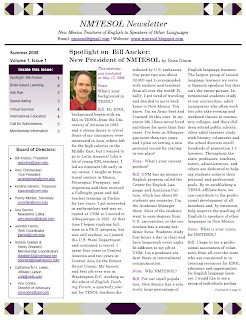 Our Fall NMTESOL Newsletter is available now! Please email us at nmtesol@gmail.com and we will send you an electronic copy as well as put your name on our mailing list. A big “thanks” to everyone who contributed to this issue. Please send submissions for our next issue to the same email address. We would love to have a description of your program, an activity you like to do, an article about ESL, or an announcement of events in your area! NMTESOL he found that it is now dissolved and no longer recognized by the Public Regulation Commission (PRC) as an active organization. We are now clear to call ourselves “Teachers of English to Speakers of Other Languages”, with “NMTESOL” as our official abbreviation. The process of acquiring non-profit 501C3 status involves 2 agencies: registering as a corporation with the state PRC and filing non-profit status with the IRS. The IRS grants the status, but before this we must be officially incorporated by the state. Different documents are required for each entity. We cannot having a checking account or accept dues before we are incorporated. Documents are lengthy and require some legal finesse, especially in selecting the correct form of incorporation. Bill has taken several workshops and sought assistance from the UNM legal aid clinic, which accepted us as a client. We will be assigned a law student in August and will submit documentation to the PRC whereupon we may be able to open our free bank account. It was brought up that we should keep searching for an efficient way to contact more K-12 instructors so that it will be easier to recruit them. The meeting was adjourned at 5:45. Our first NMTESOL Newsletter is available now! Please email us at nmtesol@gmail.com and we will send you an electronic copy as well as put your name on our mailing list. We’d like to thank all the people who worked on this issue. Feel free to post your comments on the newsletter here! The meeting began at 4:30 pm. The purpose of this meeting was to come up with a final draft of our constitution to be presented when requesting affiliation status with TESOL. All members were invited to this meeting. It was decided to make the constitution as simple as possible so that it would be easy for members to understand, and so that, if we should later file for non-profit status, we wouldn’t be unduly restricted by a cumbersome body of regulations. Web Coordinator, Newsletter Coordinator, Membership Coordinator, Affiliate Liaison, Director of Advocacy, Northern Area Representative, Southern Area Representative, and others as needed. The Board of Directors will direct the work of the organization. It is recognized that, as we grow, we may have need for more board members, representatives, and ad hoc committees. The Association will have one annual business meeting at which the new board will be elected, amendments acted upon, and general business conducted. We will try to rotate the location of this meeting to different places around the state. So that all members regardless of location can participate, voting may occur in person or by e-mail. At this time we are not calling ourselves a non-profit organization as this is a legal designation that requires filing papers. We will look into the regulations governing these designations so that we can make an informed decision about whether/or at what point we should file. A CNM BIT Faculty member who has helped other non-profit groups has been contacted in hopes of learning more. Kristina Sievers, the treasurer will set up a bank account in the NMTESOL name that will be accessible to officers. The officers will pay their own dues to open the account and we will then start collecting dues from all members. A provision was written into the constitution that would provide for the transfer of treasury funds to TESOL or a non-profit organization with similar goals in case our association were ever dissolved. Jennifer Herrin will forward these minutes and a copy of the draft of the constitution to the membership. It is anticipated that TESOL may request further changes when the draft is submitted. The meeting adjourned at 6:15 pm.